In an earlier article, I had run a regression analysis on the "Saw" movies in an effort to predict the box office results of Saw 6. (For those unfamiliar with regression analysis, it's a statistical method that searches for correlation among phenomena. It uses calculus to find the mathematical equation that best fits a group of numerical data. This type of math is really labor intensive, and for large data sets was near impossible before the computer age. I don't know how the calculus works, but that's OK for my purposes. I just think of statistical software as a "magic box" that spits out predictive functions when I put numbers into it. In this case, the software will be spitting out a function that tries to explain the box office results of James Bond movies in terms of various other bits of data that seem to increase or decrease a film's gross.) In my analysis of the Saw movies, the results showed that after an initial "sequel bump", (I think because of built-in publicity that boosted the box office of the second movie,) the series faced diminishing marginal returns with each film. To analyze the James Bond franchise with the same methodology has its own challenges. First of all, to compare Bond films, which have been released over many decades, I needed to adjust for inflation. So using a nifty online Consumer Price Index calculator I put everything into 1963 dollars (the year of the release of the first Bond film, "Dr. No."). Secondly, unlike the Saw films which have been released every year at Halloween since 2004, the Bond movies have been inconsistently released since 1963. Because of this the principle of diminishing marginal returns may not be so apparent, as over time there have been new generations of Bond fans, replenishing the returns of the franchise. 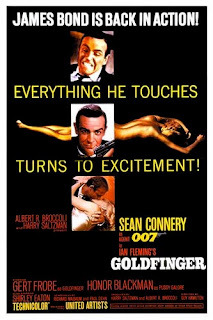 A twelve year old kid watching "Dr. No" in 1963 might years later get sick of watching Bond films, but will one day be replaced by another twelve year old kid watching "Goldeneye" and so on. 2. The order of release of each film (1-23). 4. The order of release of each film within a Bond actor's series of films. 6. The US population for the year of release. This should help adjust for the population shifting that has happened over decades. While the Saw movies more or less happened in a population stable environment, this is not true for Bond. As you can see from the data, the more recently released Bond films, when adjusted for inflation aren't as spectacularly successful as they might seem. It looks like Thunderball did the best, and in 2009 dollars, that film's gross would have been $427,953,216! what a success. 1. Population plays a role in determining box office gross ($850 added to the gross for every thousand US residents). 2. While there appears to be diminishing marginal returns for the Bond series as a whole (in the function losing around $5 mil per film), there appear to be increasing marginal returns for each Bond actor as they continue to make films. This is shown by the positive "bond sequel dummy" variable and the positive "bond number" variable. I found this surprising. Maybe, as more films are released, the audience and the actor form a bond (I know, you're groaning right now). So now lets try to predict the US gross of the next Bond film, if it ever gets released. So expect the next Bond movie to make around $187 mil. Not really though. Countless other variables are at work, and the most important variable is impossible to determine until the movie is finished. This is the "how much will people like it" variable. There really is no accounting for taste.